A bacterial biofilm is a complex network of bacteria and host tissue. We are using protein X-ray crystallography to study its molecular components in detail. Our research is mainly directed towards understanding bacteria-bacteria and bacteria-host interactions, with the long term goal to shed light on biofilm formation and infection mechanisms. The first step towards understanding these molecular interactions is to study the structure and function of bacterial surface molecules that are involved. Investigating the structures of these surface proteins at an atomic level is the first step towards the possibility to interfere with certain interactions to hinder attachment and infection. The main technique that we are using is protein X-ray crystallography. In addition, we are involved in several other projects where structure biology is one of the main techniques to answer biological questions. 1. Surface adhesins expressed by oral streptococci. Streptococci are among the first colonizers of the oral cavity when the oral biofilm (dental plaque) is formed. The composition of the oral streptococci is the first step towards determining whether the biofilm will exist in commensal harmony with the host of if pathogens will proliferate and cause caries and periodontitis. One of the surface adhesins that is commonly found on oral streptococci, and important for the formation of the oral biofilm, that is antigen I/II (AgI/II). AgI/II is a very large protein and we have solved several crystal structures of domains from both Streptococcus gordonii and Streptococcus mutans AgI/II. AgI/II is also expressed on Streptococcus pyogenes, and we have solved structures of the S. pyogenes protein for comparison. 2. Porphyromonas gingivalis proteins. P. gingivalis is a Gram-negative late colonizer that is the main cause of adult periodontitis. P. gingivalis known to hide from the human immune system and to be involved in the onset of systemic diseases such as cardiovascular disease and cancer. We are studying its surface molecules in order to understand how this bacterium can attach to the oral biofilm and to host cells. 3. Actinomyces oris proteins. A. oris is, as the oral streptococci, among the first colonizers of the oral biofilm. A. oris expresses two forms of pili, type-1 and type-2. We have solved the crystal structures of the main component the type-1 pili (FimP) as well as the enzyme, the sortase, that is needed to polymerize the subunits into mature pili. We are also interested in its disulfide forming mechanism, necessary to correctly fold pili proteins and other virulence factors. 4. Cyanobacteria. Cyanobacteria are photosynthetic bacteria interesting for both the production of biomass and biofuel. 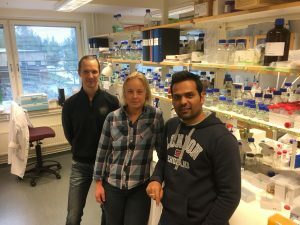 In collaboration with Christiane Funk (Umeå University) and Karin Stensjö (Uppsala University) are we studying the structure and function of several key enzymes.